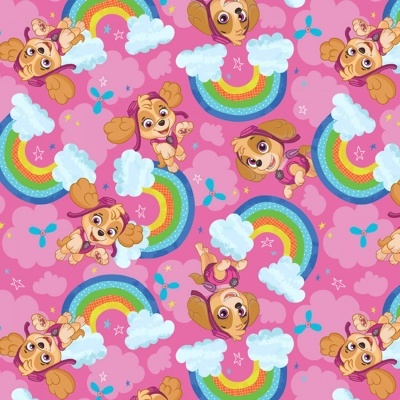 Skye and glittery rainbows design on a pink cloud background, 100% cotton from the David Textiles Paw Patrol cotton collection. 110cm / 44" Width, this fabric weighs approximately 150gsm. Multiples of a size will be cut as one piece unless requested otherwise. This is very pretty, good quality fabric with a sparkle. I was asked to make paw patrol book cushion by a mum for her little girl for Christmas. The mum was thrilled with it and said her little girl would just love it.